Deacon Mick Humbert of Guardian Angels in Oakdale is offering his bicycle and endurance for the 3,900 miles between Homer, Alaska, and his home in Oakdale to help guests at Hope for the Journey Home, the parish’s temporary shelter for homeless families. For $10 a ticket, anyone can purchase a chance to guess how long it will take Deacon Humbert to get from “Homer to Home.” Prizes for the closest correct guesses include a $500 gift card to Erik’s Bike Shop and several vacation packages. A computer on Deacon Humbert’s bicycle will track the time he spends pedaling. The donations will help fund renovations to make the shelter at Guardian Angels more comfortable for families in search of a permanent home. “This is a fun way to engage the parish in what’s going on,” said Cheryl Peterson, coordinator of justice and outreach at Guardian Angels. Deacon Humbert left for Alaska on June 13. At weekend Masses, parishioners will be updated on his progress through the Yukon Territory and over the Rocky Mountains back to Minnesota. How you can helpTo learn more about Hope for the Journey Home and buy a guessing ticket for Deacon Humbert’s bicycle tour, visit guardian-angels.org and click Homer to Home. 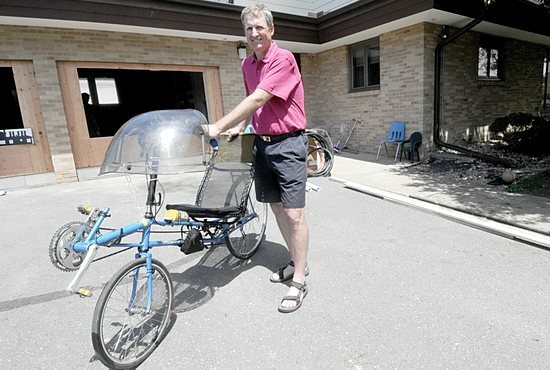 For Deacon Humbert, “Homer to Home” is a way to make his tour more than just a long bicycle ride. “I do this as a stunt to focus it on something else,” he said. Deacon Humbert has done 10 charity bicycling tours in the last 15 years. The former tournament tennis player started cycling in a recombinant bicycle at age 30 to recover from a back injury and also to find a new way to stay active. He said like everyone else, he started with short rides that slowly expanded. Eventually, he wondered if he could cycle the 111 miles to his parent’s cabin in Spooner, Wis., and he proved he was capable. “Then I became sort of fanatical,” he said. He used his first weeklong cycling tours as fundraisers for Habitat for Humanity. Since then, Deacon Humbert has pedaled around Lake Superior, from Baton Rouge, La., to Minnesota, and from Bellingham, Wash., to Virginia. Each trip promoted and raised money for a different cause. Deacon Humbert covers the expenses of the tour, so all donations go directly to the charity. He also contacts the churches along his route in search of hospitality. His requests to simply camp on the church property are usually met with an offer of indoor hospitality. It’s the combination of the time he spends with people and the time he spends by himself that makes the tour special. “It’s my version of a retreat,” he said. Now 56, Humbert said this likely will be his last long haul on a bicycle. It also will be his longest, beating his tour from Bellingham, Wash., by 500 miles. However, he originally wanted this final tour to span across the U.S. That would have meant riding from Homer to Key West, Fla. He settled for starting at the northern limit of pavement and cycling only 3,900 miles back to the Twin Cities. The ring of “Homer to Home” also well suits this tour’s cause — expanding the living space of the parish’s shelter. The money raised through selling guesses will fund renovations to make the three-car garage attached to the residence into a much-needed living room. Since opening in spring 2012, Hope for the Journey Home has averaged a 73 percent occupancy rate and hosted 76 families totaling 253 individuals — 93 adults and 160 children. The shelter has seven bedrooms to host up to seven families, which means sometimes having more than 30 guests at a time. Though children are in school and parents are either at work or meeting with case workers at St. Andrew’s Community Resource Center during the day, the house fills up in the evening. Currently, the only dining and inside play area is a combined space with three small tables on one side and a couple of closely grouped couches with toys in between on the other. The renovation will increase the communal space by 400 percent. “It will give [the guests] room to think and breathe,” Deacon Humbert said. Crossing four mountain passes on his route from Alaska to Minnesota, Deacon Humbert will be doing plenty of his own breathing. Of the 500 guesses already sold, the greatest number of hours guessed was 31,000. Humbert said he could walk to Alaska and back in that time, so he’s giving a hint. However, he said his hours on the bike are less important than the thousands of hours volunteers put in at Hope for the Journey Home. « If God is everywhere, why go on a pilgrimage?